Although lower extremity amputation is common among patients with ESRD and often portends a poor prognosis, little is known about end-of-life care among these patients. The authors’ analysis of a national cohort of Medicare beneficiaries finds that patients with ESRD are far more likely than those without ESRD to undergo amputation during their final year of life. 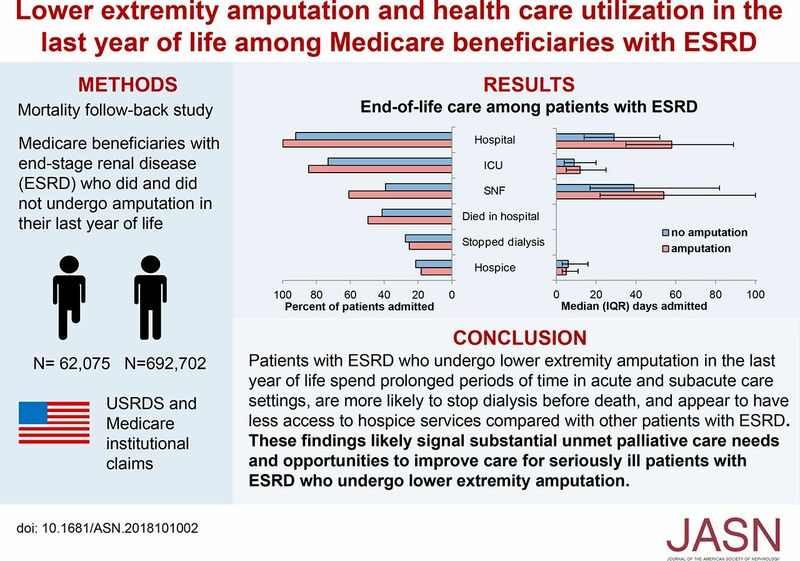 Among patients with ESRD, having a lower extremity amputation was associated with admission to and prolonged stays in acute and subacute care settings during their last year of life, as well as with dying in the hospital, discontinuing dialysis, and fewer days receiving hospice services. These findings likely signal unmet palliative care needs among seriously ill patients with ESRD who undergo lower extremity amputation. Background Lower extremity amputation is common among patients with ESRD, and often portends a poor prognosis. However, little is known about end-of-life care among patients with ESRD who undergo amputation. Methods We conducted a mortality follow-back study of Medicare beneficiaries with ESRD who died in 2002 through 2014 to analyze patterns of lower extremity amputation in the last year of life compared with a parallel cohort of beneficiaries without ESRD. We also examined the relationship between amputation and end-of-life care among the patients with ESRD. Results Overall, 8% of 754,777 beneficiaries with ESRD underwent at least one lower extremity amputation in their last year of life compared with 1% of 958,412 beneficiaries without ESRD. Adjusted analyses of patients with ESRD showed that those who had undergone lower extremity amputation were substantially more likely than those who had not to have been admitted to—and to have had prolonged stays in—acute and subacute care settings during their final year of life. Amputation was also associated with a greater likelihood of dying in the hospital, dialysis discontinuation before death, and less time receiving hospice services. Conclusions Nearly one in ten patients with ESRD undergoes lower extremity amputation in their last year of life. These patients have prolonged stays in acute and subacute health care settings and appear to have limited access to hospice services. These findings likely signal unmet palliative care needs among seriously ill patients with ESRD who undergo amputation as well as opportunities to improve their care.